Starbucks got it right. 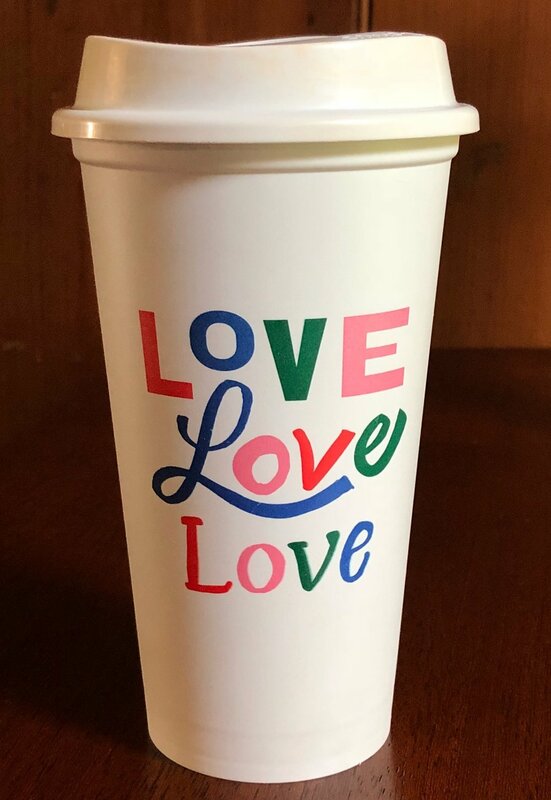 I was sitting across the table at a meeting recently and couldn’t help but notice the Starbucks cup that Pastor Beth was drinking from. It simply said Love, Love, Love. I wonder sometimes if we have not over complicated the gospel. Jesus summed up all of scripture in this: Love God and love our neighbor. There is a man I’ve gotten to know. Well, I say I know him. The truth is I’ve never met him. I’ve read his book, seen some videos and have heard him speak on a couple of occasions. But it feels like I know him. His name is Bob Goff. Bob seems to have two defining characteristics. He is perpetually joyful. Seriously, the joy of Christ just overflows from this guy. He has an exuberance and passion for life that is absolutely contagious. And, as near as I can tell, he loves everyone! He loves his wife and he loves the mailman. He loves his best friends and he loves complete strangers. He loves cranky neighbors and he loves orphan children halfway across the world. He just loves people, because this is what it means to him to follow the leader. God loved us while we were yet sinners, and as an expression of that unconditional love, He sent his own son to give his life that we might be saved. Over 2000 years, Christianity has become quite complicated. Deep thinkers, Biblical scholars and learned theologians have broken down and nuanced every aspect of our faith. And there is a time and place for much of that. But increasingly I believe it comes down to this: LOVE. Love God and love our neighbors. Love is not always simple. Love sometimes means boundaries. Love sometimes means accountability. But love also means grace and forgiveness. What makes it love is it is born out of a genuine desire to bless others. Love wants the very best for others. Love leads us to share the gospel with those who do not yet know Jesus. Love motivates us to generosity and kindness. And love sends us out into the world to serve and help others. Everyone needs Jesus. How do we effectively reach others with the good news? In our rapidly changing world, our methods may change, but the foundation remains the same. LOVE. When we love others as Jesus has loved us, it opens the door to sharing and invitation. Let’s keep it simple. Love God. Love Others. Do Good. Ladies, don’t forget our Alive Women’s Retreat coming up in just over a week. Info and registration here. We also have our Rock Run Raiser coming up on Saturday Oct. 13. I’ll be running in it. I hope many of you will join me in “Getting dirty for good!” Info and registration at www.rockrunraiser.com.